OCULAR SURGERY NEWS Latin America Edition strives to be the global, definitive information source for ophthalmic professionals by delivering timely, accurate, authoritative and balanced reports on clinical issues, socioeconomic topics and ophthalmic industry developments, as well as presenting clinically relevant information on surgical techniques and medical therapies for the benefit of the patient. The Latin America Edition is distributed to more than 18,000 eye care professionals throughout the Latin American region. It is published 6 times per year. OCULAR SURGERY NEWS Europe Edition strives to be the global, definitive information source for ophthalmic professionals by delivering timely, accurate, authoritative and balanced reports on clinical issues, socioeconomic topics and ophthalmic industry developments, as well as presenting clinically relevant information on surgical techniques and medical therapies for the benefit of the patient. 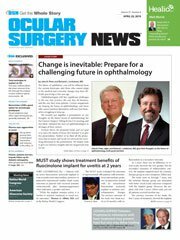 Content in the Europe Edition is targeted specifically toward ophthalmologists in Europe. It is published 10 times per year and is distributed to more than 22,000 eye care professionals on the continent. OCULAR SURGERY NEWS Europe/Asia-Pacific Edition strives to be the global, definitive information source for ophthalmic professionals by delivering timely, accurate, authoritative and balanced reports on clinical issues, socioeconomic topics and ophthalmic industry developments, as well as delivering clinically relevant information on surgical techniques and medical therapies for the benefit of the patient. It is published 12 times per year, and it is distributed to more than 55,000 eye care professionals throughout Europe and the Asia-Pacific region. OCULAR SURGERY NEWS Asia-Pacific Edition, the official news source of the Asia-Pacific Academy of Ophthalmology, strives to be the global, definitive information source for ophthalmic professionals by delivering timely, accurate, authoritative and balanced reports on clinical issues, socioeconomic topics and ophthalmic industry developments, as well as presenting clinically relevant information on surgical techniques and medical therapies for the benefit of the patient. It is published 10 times per year, and it is distributed to more than 33,000 eye care professionals throughout the Asia-Pacific Region.